As you’re probably aware of by now, the summer movie lineup for 2012 looks incredibly strong with such offerings like The Avengers, The Dark Knight Rises, and the new Spider-Man movie. Among this group of highly-anticipated summer movies is Ridley Scott’s Prometheus, that Alien prequel that’s not really an Alien prequel. Unlike the aforementioned super hero summer movies, there’s a little bit more mystery surrounding Prometheus. Is it, in fact, a prequel to Scott’s incredible Alien movie or not? Yes and no. There’s really no clear answer because there are very tangible aspects from the previous movies that make their way into Prometheus like the Weyland Industries company. The Weyland group has been apart of the Alien series since the beginning, and the fact that the company is predominantly featured in Prometheus gives it the prequel feel. While doubtful, I hope this clears things up some concerning the “prequel status” of Prometheus. As for the new trailer, which leads this article, a lot of people are saying the new footage is full of spoilers. To be sure, there’s footage we haven’t seen before, but to say it gives the entire movie away might be a little misleading. When compared to something like The Avengers, Prometheus is still shrouded in mystery, and it’s marketing team is doing a great job keeping the dynamics of the story under wraps. Or are they? Because I was skeptical about the amount of spoilers, I did not look at the big picture the way the Guardian did. 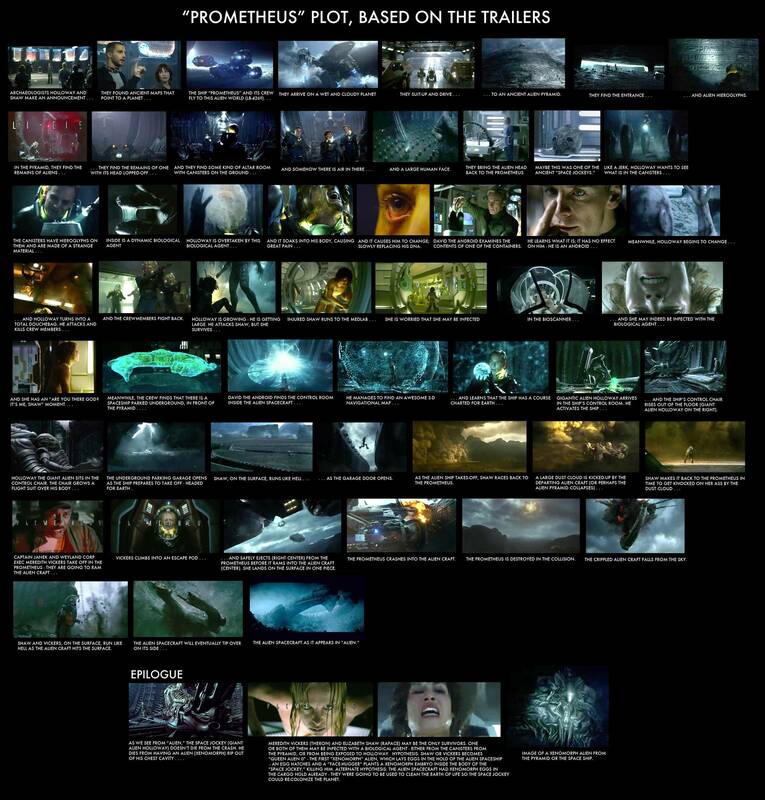 Much like the previous tweet suggests, the Guardian, based on the footage in the trailers, has created a potential plot timeline that looks very reasonable. Visit it at your own risk of being potentially spoiled.